You like her. You really, really like her. You want to impress her with something different. Something spontaneous and fun, but you are having trouble thinking of ideas. Well, Voila! 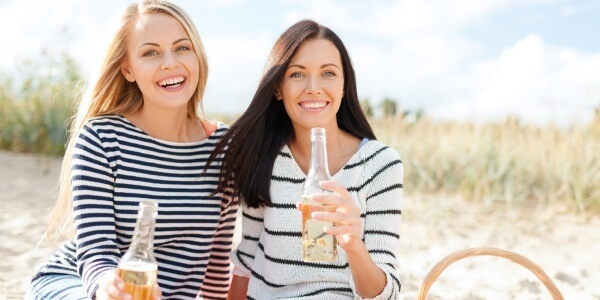 Your problem is solved with these 6 types of fun lesbian date ideas. Do you want to keep it low key? Perhaps budget is an issue? Never fear – you can still impress and delight her. Invite her for a throwback evening of board games and revisit your childhoods together. Remember Candy Land? Chutes and Ladders? Parcheesi? Or try the challenge of a jigsaw puzzle – the more pieces the better. Not a board game type of person? You can always rent an exercise video you can do together or pop some popcorn and plan for a double feature movie night. But what if she’s not local and you want to take it up a notch? match.com offers some on-site, real-time features and functions including Stir, match’s unique Happy Hour and other live events you can do together. Is she athletic? Does she like physical activity? Trampoline parks are popular now and can give you both lots of exercise and laughs. How about miniature golfing? Rock climbing? There are great local facilities that offer indoor rock climbing walls. Does she like baseball? Football? Basketball? Surprise her with tickets to a game in your area or curl up on couch to watch a game on TV. If your lady likes amusement, one of many fun lesbian dates is getting that adrenaline rush go carting. Or consider checking out the local zoo, carnival or circus. How about playing tourist – in your own town, of course. Load up with local information on your phone or go the old-fashioned route with maps and brochures and explore the city. Do remember to bring your cameras! How about a rollercoaster ride, or maybe fun in the sun at a water park. A unique feature of dating site Zoosk, is its connectivity with other apps, including Facebook. If you want more ideas about what she likes, check her Facebook page and be a step ahead in finding fun date ideas she’ll most likely be interested in. Nothing is as satisfying as giving back, and a date where you are both doing just that gives you a unique bond. Are either of you animal lovers? Volunteer at a local animal shelter: take the dogs for long walks. Contact local rescue groups and volunteer your gas, car and time to transport an animal to its foster or forever home. Horse lovers? Find a barn that gives therapeutic riding lessons. Is it winter? Chances are your local soup kitchen is in full swing – offer your time and do whatever needs doing. Does she enjoy learning new things? Sign up for a cooking class the two of you can take together. Do you enjoy vino? Check into a wine making class. Perhaps something intellectual is more in line? Find out what short courses are available at a local college or adult classes in your area school district. If she loves art, call the museum to see what courses they offer or take a guided tour. Does she have rhythm? Surprise her with a dance lesson, as long as you are her partner, of course. Romance is the ultimate goal. So let’s explore some great lesbian romantic date ideas. The way to a woman’s heart is in many cases through her stomach. Be creative on the food front, gather your baskets and truck on down to the farmer’s market. Stock up on all the things you will need to cook an exotic dinner together at home. If you want to continue your magical night, go stargazing! Just visualize: a blanket spread out under the stars, a bottle of icy white or robust red wine, and a sky full of twinkling, magical entertainment. A picnic in the country is a classic in the romance book. Better yet, take your bikes and pedal to a meadow filled with wildflowers and shade trees, and enjoy some great homemade sandwiches. Now that you’re full of great date ideas, it’s time to initiate and surprise your partner with a spontaneous activity. Having problems finding that compatible match? Dating sites that cater exclusively to the lesbian community and it is a targeted way to find women who want the same things as you do. If you join, take advantage of its in-depth personality profiling to discover more about yourself while finding your ideal woman. When you have a lot in common with your special lady, fun lesbian date ideas abound!